Welcoming Social – Fri Aug 21…. 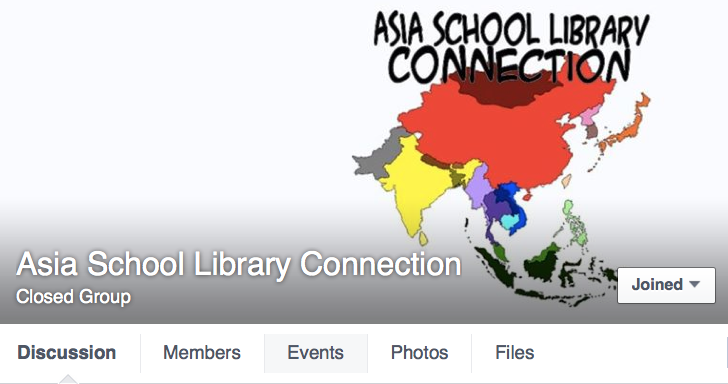 and a new online sharing space for us TLs in Asia…. There’s a new Facebook group for teacher-librarians working in Asia, started by Dianne McKenzie, called Asia School Library Connection. I would encourage you all to join. I think it’s a nice complement to the ECIS iSkoodle one. Dianne, as many of you know, has been in Hong Kong for many years, most recently at Discovery College and Renaissance College, but has now gone freelance, with a special focus on IB Workshops. Her blog is Library Grits — and her website is School Librarian Connection. Would love to see you then — if not, remember, our first meeting of the year will be on Wednesday, September 16th, at the new Dulwich College Singapore campus in Laura Taylor’s library – 4:00 for 4:30pm start.